Now Windows 8 supports the UEFI bootloader and I have read that its different from the BIOS, but it's unclear to me after many searches on the Google. As we all know, BIOS is an important part of accessing boot options. So UEFI will do that now? How? How would I know that I'm booting with UEFI not with BIOS? So what is the real difference in the "boot with BIOS" and "boot with UEFI"? As we all know that BIOS is important part for accessing boot option. So now UEFI will do that? How? BIOS boots by reading the first sector on a hard disk and executing it; this boot sector in turn locates and runs additional code. The BIOS system is very limiting because of space constraints and because BIOS runs 16-bit code, whereas modern computers use 32-bit or 64-bit CPUs. By contrast, EFI (or UEFI, which is just EFI 2.x) boots by loading EFI program files (with .efi filename extensions) from a partition on the hard disk, known as the EFI System Partition (ESP). These EFI boot loader programs can take advantage of EFI boot services for things like reading files from the hard disk. As a practical matter, if you're using an OS like Linux that has complex BIOS-mode boot loaders, EFI-mode booting is likely to be similar to BIOS-mode booting, since GRUB 2 (the most popular BIOS-mode boot loader for Linux) has been ported to work under EFI, and many Linux distributions install GRUB 2 by default on EFI systems. OTOH, you can replace or supplement GRUB 2 with other EFI boot loaders. Indeed, the Linux kernel itself can be an EFI boot loader; code was added to do this with the 3.3.0 kernel. Used in this way, the EFI itself loads and runs the Linux kernel, or you can use a third-party boot manager like rEFInd or gummiboot to let you select which OS or kernel to boot. As Root says, there are clues in the firmware's user interface; however, those are unreliable and vary from one computer to another. The only way to be sure is to check to see how the computer booted. In Linux, for instance, the presence of a directory called /sys/firmware/efi is diagnostic. If it's present, you've booted in EFI mode; if it's not present, you've probably booted in BIOS mode. (This directory can be absent on an EFI-mode boot under some circumstances, though.) dmesg output that refers to EFI is also diagnostic of an EFI-mode boot. In Windows, the partition table of the boot disk is diagnostic; if it's GPT, you booted in EFI mode, and if it's MBR, you booted in BIOS mode. So what is the real different in the "boot with BIOS" and "boot with UEFI"? EFI can be faster, but that's not certain. The biggest speed difference is in hardware initialization early in the process. On my systems, this is a fraction of the total boot time, so a reduction in the hardware initialization time, while good, doesn't make all that much difference. It's not like I'm rebooting every ten minutes, after all. UEFI supports a feature called Secure Boot that's intended, as the name suggests, to improve security. It does this by requiring a digital "signature" of boot loaders, which in turn should require signing of kernels, and so on up the chain. This should make it harder for malware authors to insert their code into the pre-boot process, thus improving security. This sounds good, but it also complicates dual-boot configurations, since code like GRUB and the Linux kernel must be signed. The major Linux distribution vendors are working on ways to make these requirements less of a burden for average Linux users, and they've got some preliminary stuff ready. At the moment, though, disabling Secure Boot is the easiest way to deal with it. This is a practical concern mainly for brand-new computers that ship with Windows 8, since Microsoft is requiring Secure Boot be enabled to get Windows 8 certification. Some people confuse UEFI and Secure Boot (the latter is just one feature of the former), but it deserves mention as a difference between BIOS and UEFI because it's causing some problems for new Windows 8 computers. If you've got an older system or are comfortable enough with firmware setup utilities to disable Secure Boot, this need not be a real problem. Microsoft ties the boot disk's partition table type to the firmware type (MBR to BIOS; GPT to UEFI). Because MBR tops out at 2TiB (assuming standard sector sizes), this means that UEFI is a practical necessity to boot Windows on over-2TiB disks. You can still use such big disks as data disks under Windows, though, and you can boot some non-Microsoft OSes (such as Linux and FreeBSD) on big disks using GPT under BIOS. As a practical matter if you're concerned about or interested in UEFI, the biggest issue is simply that UEFI is new enough that support for it is a bit spotty, particularly in some older and more exotic OSes. UEFI itself is new enough that most of its implementations are buggy, and those that aren't vary enough amongst themselves that it can be hard to describe things generally. Thus, using UEFI can be a challenge. OTOH, UEFI is the future. It's got some modest advantages, some of which will become more important in time (such as the 2TiB boot disk limit of Windows). Switching to a UEFI boot will change a few details of the boot process, but your overall computing experience won't change all that much once you overcome any boot issues you may encounter. Could you expand on the OpRom settings (Option Rom). They seem to allow you choose between UEFI booting or "Legacy" booting and they apply to the Video card, Network card, and various other PCI devices. Many plug-in cards provide firmware that interfaces with the firmware on the motherboard. The two types of firmware must be able to "talk" if the card's firmware is to do any good. This is necessary to use the card before an OS boots -- for instance, to display your firmware's options or a boot manager menu on a video card, to perform a network boot via a network card, or to boot from a hard disk connected to a disk controller card. I don't know precisely what each of the settings you note does. For instance, I don't know if "BIOS only" for one of these options would make the card work only in BIOS mode, "translate" so that the EFI can use the BIOS-mode calls in EFI mode, or something else. In fact, given the lack of standards in other EFI user interface areas, I would expect the details to differ from one EFI to another, so you may need to consult your computer's documentation or experiment if you need to know the details. I've seen some computers with very similar-sounding options in two different menus, which further complicates matters. UEFI is a cross-platform firmware interface that replaces the x86-specific firmware standard named BIOS. Many UEFI implementations also include a BIOS compatibility/"legacy" mode, to enable booting from MBRs and presenting a BIOS-like interface to OSes; however, this is not required by the standard. If you have a UEFI-compatible motherboard that offers compatibility/legacy BIOS booting, then its firmware menu will provide choices such as setting a default boot mode or even booting single devices in either UEFI or BIOS mode: Otherwise, there might not be an easy way to tell, without e.g. probing the firmware using an OS. UEFI defines a similar OS-firmware interface like BIOS but is not specific to any processor architecture. BIOS is specific to the Intel x86 processor architecture, as it relies on the 16-bit "real mode" interface supported by x86 processors. UEFI can be configured to expedite various parts of the booting process, for example, UEFI on Gigabyte GA-EP45-DS3 initializes in 11 seconds versus BIOS in 19 seconds. UEFI mode may present different firmware/hardware features to the same installed OS than BIOS mode would. See more info about UEFI. Q: As we all know, BIOS is an important part of accessing boot options. So now UEFI will do that? How? A: This is a confusion about the terms. E.g. “Enter the BIOS to change blabla.” The politically correct term is “firmware setup utility” for that thing you enter. If you talk about “BIOS” contrasting it with “UEFI”, it refers to something else, namely: the boot execution environment. So if you mean that setup utility, then a) don’t call it UEFI and b) it is basically the same thing as in former times. How the setup-utility communicates with the hardware and it’s permanent storage is private to the firmware. So nothing changed there, either. Q: So what is the real different in the "boot with BIOS" and "boot with UEFI"? A: The environment the boot-loaders find themselves in is different. And with UEFI, that environment is clearer specified, way more modern and feature-rich. Not the answer you're looking for? Browse other questions tagged bios uefi or ask your own question. Should I install an OS using UEFI or BIOS (legacy/CSM) boot mode? How is UEFI different from a BIOS? How do I get my system to find a “buried” MBR? Why my ASUS motherboard has a “UEFI BIOS”? Dual boot with BIOS and EFI? 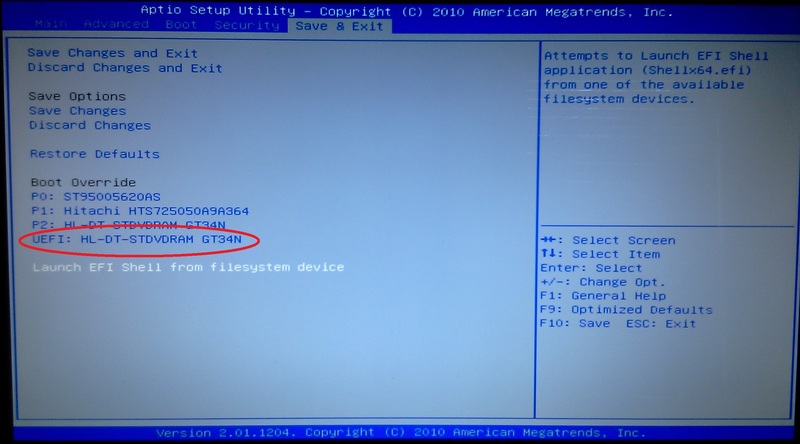 What is a “UEFI-bootable” USB flash drive and can I boot it on legacy BIOS? Does my BIOS supports UEFI?